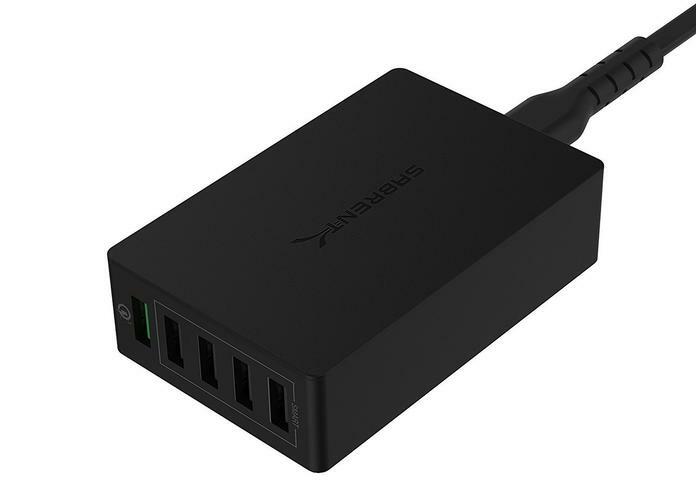 Sabrent’s Quick Charge 5-port USB charger is now selling for more than 25% off its average price. Keeping your devices charged up and ready to use is an essential part of tech ownership, but if you have multiple devices (or multiple people) trying to use the same outlet, charging can get... complicated. That’s why multi-port USB chargers are so great —even with a single outlet, you can keep all your mobile devices at peak battery. Today, you can get Sabrent’s Quick Charge 5-port USB charger for its low price of $17, which is more than 25 percent off its average price on Amazon. Five ports is a lot, especially at that price point, so this charger is perfect for families or people juggling several devices. One of those ports features an additional benefit: Qualcomm Quick Charge 3.0, which enables even faster charging (up to four times as fast as a standard charge for devices that support the feature). The other ports work as standard USB chargers. We haven’t tried this charger ourselves, but Amazon’s user reviews provide some positive feedback, with 4.5 stars out of 5 over more than 2,300 reviews. It’s also fulfilled by Amazon, so you’ll be able to work with Amazon’s great customer service if you have any issues. Now, if you’d rather charge up on the commute, take a look at our guide to the best USB car chargers.